HLB has cost Florida citrus growers an estimated $1.3 billion since 2005. 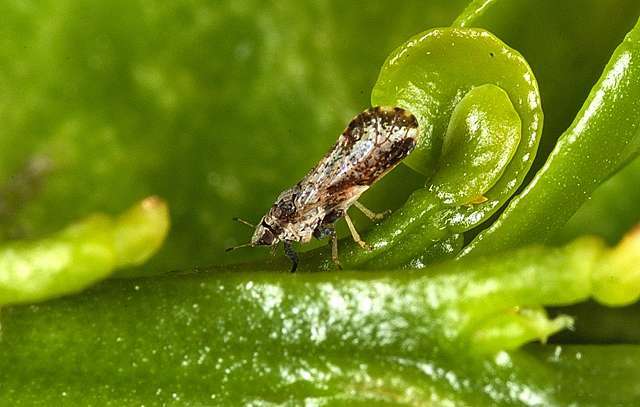 The disease is caused by a bacterium spread by the Asian citrus psyllid, which feeds on leaves of infected trees and carries the disease from tree to tree. Insecticides are currently the best option for controlling HLB. David G. Hall, with Agricultural Research Service's (ARS) U.S. Horticultural Research Laboratory in Fort Pierce, Florida, studied whether trees are more susceptible when producing new leaves-a cyclical phase known as "flush" that happens three or four times a year. Flushing cycles in Florida citrus usually occur in February, in late May, and again in late August. Researchers can prompt new leaf development at almost any time of year by trimming small branches. Hall and his colleagues trimmed the branches of groups of trees at three staggered intervals. The first group was trimmed three weeks before being exposed to infected psyllids to simulate trees in their "old flush" stage. A second group was trimmed two weeks later to simulate "new flush," and a third group was trimmed two weeks after that to simulate trees that were not in flush. Immediately after the third trimming, the scientists released HLB-infected psyllids and let them feed for a week. The researchers evaluated infection rates after six months. The results indicate that trees in flush had much higher infection rates than the "no flush" trees, and that the first group of trimmed trees (old flush) experienced the highest infection rates. In one trial, trees exposed to HLB at their old flush stage were 80 percent infected, those exposed during young flush were 23 percent infected, and those with no flush were only 3 percent infected. The findings show growers the importance of monitoring for psyllids when the trees are in flush, and that it's the older-flush trees they really need to worry about and target with insecticides, Hall says.